Washington, D.C., is flush with new tax revenue… and Wall Street is riding high with the big stock indexes near record highs. Meanwhile, in places far from the centers of power, we’re seeing one of our forecasts play out. Now nearly two years old, we said the “mother of all financial bubbles” would make itself felt first on the local level. Josephine County, Ore. — population 83,000 — sits on the California state line. As long ago as 2007, the county government ran out of money for the libraries and shut them down; they’ve since reopened under the auspices of a nonprofit group. It happened in Josephine County last August. The story “went viral” only last week. The intruder — the woman’s abusive ex-boyfriend — eventually broke in, attacked and fled. Then police swung into action and arrested him. “If you don’t pay the bill, you don’t get the service,” said Josephine County Sheriff Gil Gilbertson. Budget cuts, he says, make it impossible to respond to emergency calls on evenings and weekends. “What’s left of the Josephine County Sheriff’s Dept. is basically only available 9-5,” concurs the HuffPo commenter. “You may want to consider relocating to an area with adequate law enforcement services,” the sheriff added helpfully. The Sheriff’s office does, however, have the resources to carry out marijuana raids. HuffPo’s Radley Balko put Google through its paces and came up with accounts of no less than four raids — all of them taking place since the woman was attacked in August. Turns out that even back in better days, it was federal money keeping Josephine County government afloat. “Federal forests make up 60% of the land in many rural Oregon counties,” explains the Portland Oregonian. “Because federal land isn’t subject to property taxes, the federal government for decades shared timber sale revenue with the counties. The situation is quickly moving from bad to worse. Josephine County residents narrowly rejected a property tax increase last month. Gilbertson is threatening to close the jail. And the state government might end up Bigfooting the county for having voted the “wrong” way. Gov. John Kitzhaber is imploring the Oregon legislature to grant him emergency powers. “The measure would authorize the governor to declare a public safety emergency for up to 18 months,” reports the Associated Press. His powers would include the imposition of a local income tax. Wonder what the “armed citizen volunteers” would think about that. Who knows? 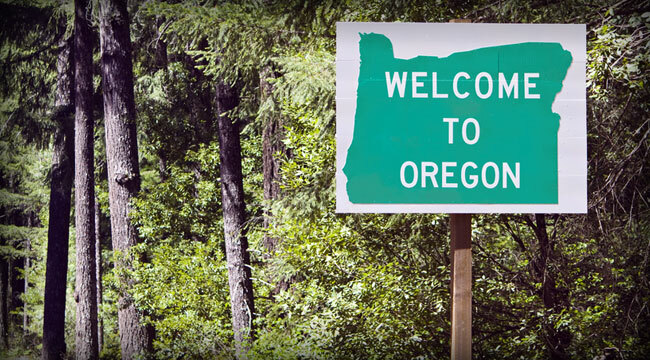 Before it’s all over, Oregon might lose its status as one of five states with no sales tax.